The RC Fokker D7: Examples of several of these World War 1 RC Warbirds. 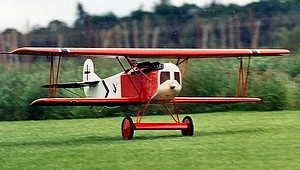 The RC Fokker D7 is described, in many versions. The full size is discussed, with some interesting facts. Sizes from 1/12 to 1/3 scale are featured. About 3.300 aircraft were produced in the summer and fall of 1918.It was a formidable fighter and the photo at left shows the airplane piloted by Rudolph Berthold. He earned a total of 44 air-to-air victories which ranked him as Germany's 7th highest scoring ace. 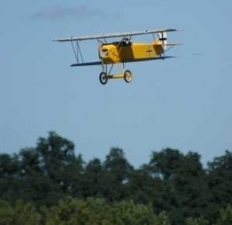 The Fokker D7 was specifically mentioned in the armistice ending World War 1. Germany had to surrender all the D V11s to the allies at the end of the hostilities. These aircraft saw many years of service, in many countries, after the war. It was probably the finest fighter produced during the whole of WW1. One advantage of the D-V11, when comparing it to other World War 1 scale models, is there are no rigging wires! Fokker designed the wings as a cantilever design that required struts but no flying or landing wires. Construction is of conventional balsa and ply, and all the parts are cut using a laser or a CNC mill. Each kit comes complete with many scale details including- Mercedes engine, vintage wheels, scale documentation, two Spandau machine guns with brass ammo, cockpit instruments, leather trim for the cockpit and an illustrated manual. Visit Arizona's web site by clicking on the photo above or or here! 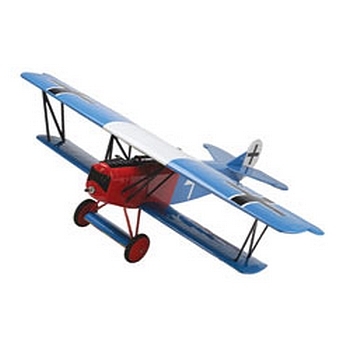 Balsa USA offers the RC Fokker D-7 in kits for a quarter scale RC version, as well as a 1/3 scale. 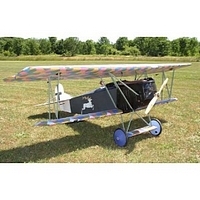 Model airplane plans are also for sale, in both sizes. Construction of these models is the conventional balsa and ply, with a covering of heat shrink fabric. Parts are produced by die cutting, rather then laser or CNC milling. The 1/4 scale model has a top wing span of 88" and a finished weight of 18-20 lbs. Power requirements are for a 1.5cu.in. 4-stroke or a 25-35 cc gas RC engine. The 1/3 size has a top wing span of 118" and a total weight of 40-45lbs. RC engines of 50-80cc capacity are required. Maybe we are leaving the best for last! Proctor Enterprises has an enviable reputation for producing very accurate kits and the D-V11 is no exception! The plans were drawn up after studying a full size airplane, in Munich Germany. 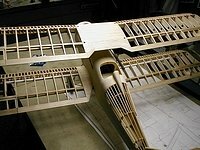 Construction is of balsa and ply, with maple dowels used for reproducing the welded tubular steel fuselage framework. The multi-tapered and beveled scale wing spars are produced on a CNC router. The wing ribs are also produced the same way. This museum quality kit is to a scale of 1/4 and finished weight is quoted at 23 lbs. Power recommendations are for a 4-stroke RC engine of 2.0 cu.in. or larger. Proctor strongly suggest a Laser 200V or 300V Laser engines are made in England and have long been a favorite of mine! All Lasers are 4-stroke RC engines and what wonderful engineering masterpieces they are. Manufactured from aluminum bar stock (no castings) they make powerful and long lived glow engines that are particularly suited to scale models. Buy a Laser-you will not be disappointed! Procter kits are definitely not quick to build, but their accuracy is second to none. Enjoy the build process and take your time. Visit the Proctor web site for full details.